This is the second “Tip and Trick” from my “Dreamforce 2 You” presentation. This tip came out of two questions and comments that I have heard a lot. How can I see my Accounts without Opportunities? Both of these items can be fixed by creating a Custom Report Type. Let’s start from the beginning; To create a custom report type you will need to go to Setup>Create>Report Types and then follow the wizard. To solve the problem of too many fields, follow the steps above. Instead of using the outer join, recreate the standard report. Use Opportunities and click “Save”. This will take you to the next screen where you will see the section named, “Fields Available for Reports”. Click on the “Edit” button and now you can start taking fields away. Make sure your users have access to the new report type and now the user experience is much better! No need to feel overwhelmed or worried with your users creating a report, you are in control of what they see and have access to! Training is much easier, and you get to keep your secrets! A couple of weeks ago I was lucky to attend and present at the, “Dreamforce 2 You” Event that was put on by the Orlando and Tampa User Groups. This was the second year of the event and it doubled in every way (tripled in some ways too – from 2 sessions to 6)! There will be more postings to come out of this event, but I wanted to start with some helpful information from my presentation about Reporting. In my presentation I shared two tips that I always rely on. I will focus on the first one today – using custom formula fields for reports/dashboards. Before you were able to add columns to a table on a dashboard (or now, overcoming the limitations), we needed another way of displaying more information while keeping a dashboard easy to read. Instead of just seeing the Opportunity Name with the Amount field, let’s use a custom formula field to concatenate some other valuable information. For this example, I was presented with a business case that the VP of a division wanted to see what new opportunities entered the funnel this week. This person wanted to see the 2 amount fields, the account, the owner, and the opportunity name (what the project is). 5 fields to display on a table. I knew I could formula field some of them together and now only display 3 fields. Here is the formula I used to combine three fields into one for a more detailed view – Account Name, Opportunity Name and Opportunity Owner. Stop causing yourself a headache with reporting and stop thinking that a formula field is only for calculations. Using a formula field for reporting purposes can solve many problems and make your dashboards more detailed while still being easy to understand. Finally, a brief, “Thank You!” to @CRMJen, @jhoskins and @jackieforce for all their hard work for putting this event on. I would also like to thank Ingo Fochler from The New York Times Company for teaming up with me for this presentation. I will blog more about this event and my second tip shortly. 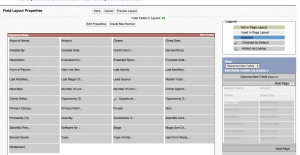 *Disclaimer – This was just one example of using a formula field for reporting/dashboard purposes. The field does not have to be on the page layout to work, but make sure you set up the field with the proper field-level security so that it is visible to your users. Welcome to my monthly “Things I didn’t know that I know now” review. Since I started this blog I have been keeping track of every word, process and acronym that I have ran into and not known. I am hoping that as time goes on, this list will keep getting shorter and shorter. Who am I kidding – the list will keep growing, technology moves so fast and I think that acronyms spawn a minimum of 3 other and new acronyms! JDBC – Java Database Connectivity -This is the API to the Java language. This means that you can use Java to connect independent databases (it is oriented towards relational databases). This is what would be used to take Salesforce.com and other databases for reporting and integration among other things. I need more time before I completely understand arrays – I see how they are set-up and know they are very important (saw them in action at Dreamforce with help from @jhoskins). Any suggestions? Welcome to cheat sheet #1. I am writing this to review what I have learned about HTML, XHTML, and CSS. Most of this is syntax that I needed to write down to help me remember! CSS gives you control over a web page and the website. Most importantly it allows for consistency throughout a website without defining formatting in HTML or XHTML. Using style rules, I can define how I want my text to look once in CSS and not have to code it each time. You can write a .css file and reference it for every web page on a site. This theme has a .css file that determines how everything I type right now looks – not matter what computer I am on, what time of day it is, or where the text comes from – because of CSS I don’t have to make sure each post looks the same, it is done automatically. For practice today I changed the color of <div class = “description”> to white on the each page of my blog – the previous color, grey, was hard to see. I found the class in the .css file and changed what I needed. No coding on the page itself and if I change the text, I won’t have to worry about formatting the new text to match. Fantastic! I also checked the CSS on my company’s website. Now that I know how CSS works, the structure and syntax, and how to write CSS, selectors and declarations, it is easy to see how it was applied to the company website and how to define and maintain our brand in every page.